I have been witness to a murder most horrid. It happened on a sunny morning at Eardington Nature Reserve, near Bridgnorth. I was standing by a shallow pond surrounded by scrub willows at the time; the surface was still and the water crystal clear. The pond’s margins were fringed with purple loosestrife. This is a wonderful plant for wildlife and, on the day in question, the flowers were alive with bees and the long leaves were providing a perch for a number of damselflies. These insects are closely related to dragonflies – the easiest way to tell them apart is to look at their wings at rest: damselflies fold their wings behind their backs while dragonflies hold theirs open. The tranquil scene belies the grisly event about to unfold. I spot a movement on the surface of the water… something is trapped in the surface film and tiny ripples are radiating out like a distress signal. I carefully lift out the floundering creature and see it’s a damselfly – alive but with a gruesome injury. Damselflies have a distinctive long body but this one has been cut neatly below the thorax, leaving only a stump with wings and legs still attached. I place the victim carefully on a plant and it immediately hides behind a leaf. Despite its mortal wound, the survival instinct is clearly still strong. I contemplate how this could have happened; the most likely suspect would be a bird such as a wagtail or hobby. After a few minutes, I spot another damselfly perched on a leaf and, as I look more closely, the reality hits me; it is slowly eating a distinctive black and blue body. 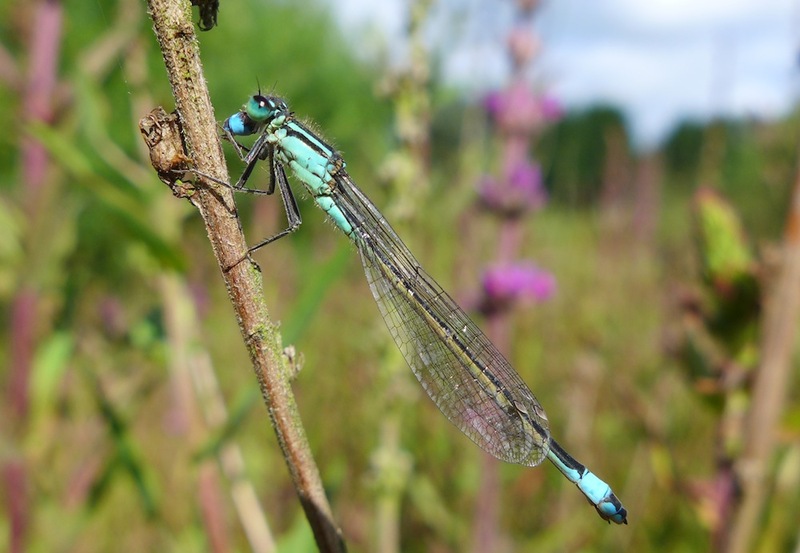 I check the markings and see that both victim and perpetrator are common blue damselflies. Damselflies are voracious predators, catching all manner of small flying invertebrates – but I’ve never before seen them feeding on others from their own species. I manage to capture the scene on my camera. After a while, the predator has completely consumed his meal and flies off. Suddenly the peace is broken by a large dragonfly flying over my head. This is a much bigger insect than the damselfly and the wings make a loud noise. It is a black-tailed skimmer, an impressive beast with a pale blue abdomen tipped with black markings. In a dazzling display of aeronautics, he chases another dragonfly high over the willow trees before darting back to the water’s edge. This is typical territorial behaviour for male dragonflies as they try to attract a female. Dragonfly and damselfly mating is a beautifully symmetrical process. The male grasps the female using ‘claspers’ (located at the tip of the abdomen). This forms a strong link between the two insects and they typically form a heart shape. While locked together, they are still capable of flying. After fertilisation has taken place, the female lays her eggs in a pond or watercourse by dipping her tail into the water. Damselflies and dragonflies are insects typical of the dog days of high summer. It is easy to forget about the next stage of their life cycle that is hidden in ponds and lakes all around Shropshire. The eggs hatch into aquatic larvae (or nymphs); if you take a net to the margins of your local pond this autumn, you may well catch one. Damselfly nymphs are normally pale green in colour, while the colour of dragonfly nymphs is more variable. Damselfly nymphs have gills at the tip of their long body (they look like tail filaments) whereas dragonfly nymphs have internal gills and are more rounded in shape. They are able to ‘throw’ their lower jaw to capture prey such as tadpoles. They grow quickly and after around two years, an incredible transformation takes place. When the time is right, the nymphs move to the edge of the pool, climb out of the water and grip tightly onto a plant stem. The larval body splits and the adult insect hatches from within. This process is known as incomplete metamorphosis, as the nymph turns straight into the adult insect without first forming a chrysalis. I find the idea of this truly incredible. Life underwater is so different to life as a flying insect, and huge changes must take place inside the body to facilitate this shape-shifting. There is a theory that terrestrial life on planet earth began when creatures moved from water to the land. That moment of evolution seems closer than ever when one watches a dragonfly emerge from a pond and fly away. Clean ponds are extremely valuable for many types of wildlife including dragonflies and damselflies. Many ponds suffer from pollution which kills aquatic life. If you have a large enough garden, why not consider creating a pond this autumn? The Million Ponds Project aims to connect a network of clean water ponds across the UK. More advice can be found at freshwaterhabitats.org.uk/projects/million-ponds/.